Moisture and dark spaces are ideal spots for mildew-growth, challenge this by purchasing quality foam. As a boat owner, it’s more than likely that you understand the nuances of dealing with mold and mildew buildup. It can occur on the side of your boat, inside your boat, and essentially everywhere that moisture can touch. 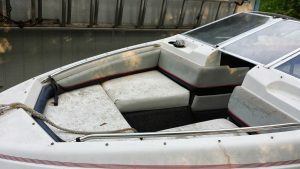 It’s not only an aesthetic stain on your boat, but it can also be hazardous to you and your passengers’ health. Here’s how you can go about to ensure a safe boat setting. It may sound obvious, but many boat owners leave a luxurious looking boat cushion onboard that’s not designed to withstand immense amounts of moisture. Boat foam is made with an open cell design that allows water to seep through it to the other side, therefore minimizing water retention. Remember, all it takes for mold and mildew to start building up is a dark and damp area. Once it begins spreading around, you’re left with having to clean it up or just throwing it out. Dry fast foam is another product that boat owners have used and loved. By enhancing the foam with a formula that fights against the growth of mold, you can essentially leave it out whenever you hit the open sea and not have to worry about a cushion filled with microorganisms. Whether you are an avid sailor, or just a novice boat owner, purchasing foam that’s built for the open sea is highly recommended. It won’t just save you from a smelly and outright disgusting setting, but it will also minimize the amount of harmful bacteria. The Foam Factory supplies the finest foam products. For boat mattress replacement products, visit them online today.